The new retirement model is all about longevity since most of us will live 25-35 years into retirement. Most people are concerned that their Social Security, pensions, and 401(k)s won't be enough income to sustain their retirement. 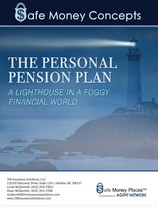 The Personal Pension Plan will help you create guaranteed lifetime income. Wealth Transfer is the transfer of financial assets to beneficiaries upon the death of the owner in a tax efficient manner through financial planning strategies that often include wills, estate planning, life insurance, or trusts.